Non-performing loans (NPLs) remain at the forefront of the European regulatory agenda, with two major consultations run by the European Central Bank (ECB) and the European Commission (EC) over the recent weeks, both in relation to the introduction of minimum prudential backstops. In the aftermath of the great financial crisis and subsequent sovereign crises, the European banking sector found itself with significant volumes of NPLs and since then, the resolution rate has been rather low. The level of bad debt sitting in European banks is estimated at USD 1 trillion, representing an average NPL ratio of 5.1% for the European Union, compared to 1.3% in the US and 1.5% in Japan. The issue is particularly acute in some countries such as Italy where the ratio is as high as 15.3% and even more so in Greece and Cyprus where NPLs account for half of the banks’ balance sheets. High NPL ratios lead to increased capital requirements, increased funding costs and lower profitability. Ultimately high NPL banks are less able to finance the real economy than sounder banks, which has a detrimental impact on economic growth and the wider public interest. 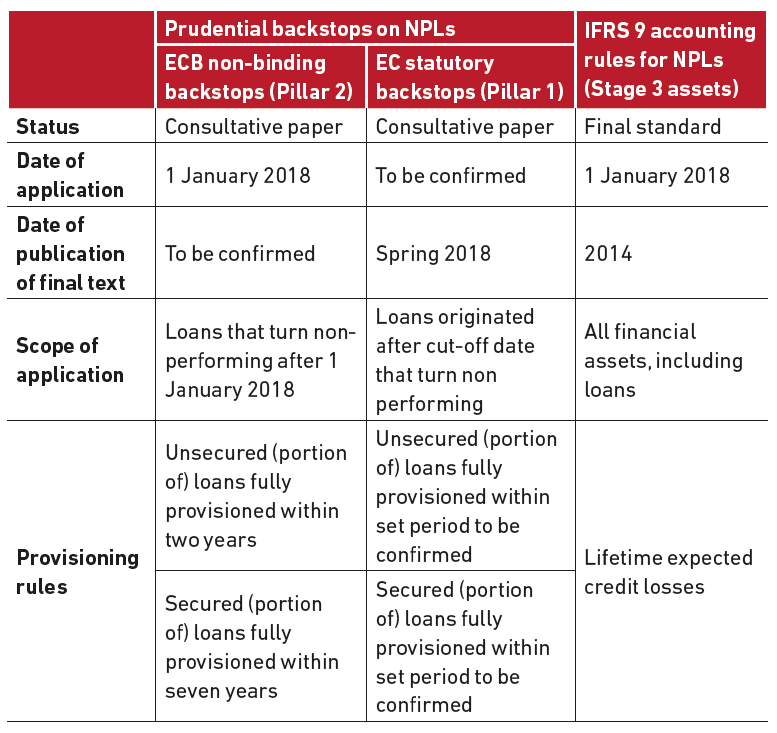 In response to the serious concerns around NPLs in Europe, the prudential and accounting standard setting authorities have been very active in recent years with the EBA Final draft Implementing Technical Standards on forbearance and nonperforming exposures (EBA ITS 2013/03), the ECB guidance on NPLs and IFRS 9 on financial instruments. Most recently, the ECB and EC have issued two consultative papers on minimum prudential backstops. Between 4 October and 8 December 2017, the ECB conducted a public consultation on a draft addendum to the ECB guidance on NPLs. The ECB, acting in its capacity of single supervisor in the Banking Union, proposes to tighten the framework set out in its March 2017 guidance. The addendum focuses particularly on provisioning and write-off. Through this addendum, the ECB’s supervisory arm aims to specify the minimum levels of prudential provisioning required for all new NPLs (i.e. loans that become non-performing after 1 January 2018), depending on (i) the NPL vintage and (ii) the quality and quantity of collateral held. i. ‘Vintage’ is defined as the length of time for which an exposure has been classified as non-performing. ii. Eligible collateral includes immovable property and other forms of protection accepted under the CRR. The guidance distinguishes between fully unsecured, partially secured and fully secured exposures. Under the new rules, banks are expected to fully provision unsecured parts of NPLs within two years of vintage, while secured parts should be provisioned at 100% within seven years of vintage. In order to avoid a cliff-edge effect on banks’ balance sheets, the supervisor expects the pace of provisioning to follow a linear path. The addendum will form part of the supervisory tools under the second pillar of the Basel framework. The ECB has specified that it will follow a ‘comply-or-explain’ approach whereby banks are expected to report on compliance and explain any deviations to their respective Joint Supervisory Teams on an annual basis. The addendum should therefore not be taken as binding, but rather as a clarification from the ECB of its minimum expectations and a common starting point for the supervisory dialogue, this in the interests of transparency. The addendum is applicable to all significant banks directly supervised by the ECB. The higher NPL banks will likely see more significant impacts on their capital requirements. However, the supervisors will also look at ensuring that all EU countries, including those with lower NPL levels, are equipped with NPL management tools that are fit for purpose, consistent across the Banking Union and readily actionable when the next crisis hits. All significant banks, with high NPL levels or not, should therefore take steps to align their provisioning frameworks. What is the scope of application? At a minimum, all loans that turn non-performing from 1 January 2018 onwards will be within the scope of application. In line with the initial ECB guidance on NPLs, banks should rely on the EBA definitions of non-performing exposures and cures (cf. EBA ITS 2013/03). Off-balance sheet items will therefore be subject to the new provisioning rules. On the contrary, the USD 1 trillion stock of existing NPLs is excluded from the scope. For now, the supervisors continue to address it with the ECB’s qualitative guidance on NPLs. High-NPL banks have prepared their strategies to reduce existing bad loan portfolios and as part of the ongoing supervisory dialogue, plans are being assessed and adjusted where necessary. The implementation will take place as soon as the final text is published. The date of publication of the final addendum has however not been confirmed yet. The consultative paper has aroused strong criticism, including legal opinions from the European Parliament and the European Council in which both institutions have stated that the ECB would overstep its mandate if the addendum was adopted in its current form, as it would set quantitative capital requirements for all banks, rather than individually tailored measures. The ECB is in the process of reviewing the feedback received during the consultation period and it may take some time before the final text is issued. While awaiting the final version of the text, significant banks under direct supervision of the ECB should start assessing impacts on their credit risk and provisioning framework. In particular, banks should look at their loan provisioning and collateral management policies, internal risk models, data, processes and systems, as well as their disclosure arrangements. The risk management teams should consider whether to implement the backstops, and report on compliance and deviations, at the exposure or portfolio level. In parallel to the work of the ECB, the EC carried out a public consultation between 10 and 30 November 2017 on “statutory prudential backstops addressing originated loans that turn non-performing”. The scope of application of the EC’s consultative paper is more limited than the ECB’s addendum as it only includes loans originated after a cut-off date (to be specified) that turn non-performing. Subject to the Commission’s final views, the proposed measures will be adopted in a legislative proposal and become part of the Pillar 1 framework. Similar to the ECB addendum, the EC measures would impose minimum coverage requirements depending on the vintage of the NPL and the level of credit protection. Banks would be required to fully cover their new NPLs within a set period of time to be confirmed (e.g. two years for the unsecured portion and six to eight years for the secured portion). The EC has indicated that the new rules should be adopted in the spring 2018 as part of a wider package of measures intended to reduce NPLs in the European Union. 2018 is set to be a pivotal year for banks’ credit risk and NPL management with new standards entering into force both on the prudential and accounting fronts i.e. the ECB addendum on NPL under Pillar 2, the EC rules under Pillar 1 and IFRS 9 on financial instruments. setters are still of the view that accounting provisions could be insufficient given the lack of common rules in valuing NPLs and underlying collaterals. Prudential backstops are being introduced in order to ensure timely and adequate provisioning and write-off of bad loans. As a consequence, banks will be required to adjust their risk management policies, internal models, processes and systems, and to report on compliance with the new prudential measures on a regular basis. Banks will also need to adjust their pricing models in order to take into account the higher cost of funding for lending to high-risk counterparts and on an unsecured basis. This raises concerns among economic actors and particularly the Small and Medium Enterprises (SMEs) sector which relies predominantly on bank lending. The balance appears difficult to strike. European banks need to clean up their balance sheets and put in place preventive measures to avoid another buildup of NPLs in order to maintain and increase their ability to lend, but can the supervisors incentivise them to get rid of bad loan portfolios without causing detrimental effects to their willingness to lend? Gregory leads Mazars’ UK Financial Services practice and co-leads our banking practice at group level. He provides support to financial services institutions and regulators to improve the way they operate and manage their risks. He is highly experienced in providing tailored solutions to complex, international issues in areas that have included stress testing at a sovereign level and reviews of banking sector risks for central and international banks. His recent consulting work has included stress testing and asset quality review at European level, risk management assessment, international data validation, deleveraging and restructuring for international banks and risk reviews for central banks and regulators to aid the improvement of banking regulations. Gregory has a strong track record working with financial institutions, Central Banks and regulators, and leading large scale projects in various jurisdictions across Europe, the Middle East and Asia.